It has been requested that this article be rewritten. Reason: Hasn't been given much substance-updating since it was created in December of 2006 (tagged on September 2, 2018). Green Kroc is one of Kaptain Skurvy's shipmates and a recurring character on the Donkey Kong Country animated series. Despite the fact that Green Kroc is a minion of Kaptain Skurvy, he does not appear in many episodes. 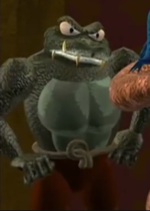 In the episodes Green Kroc does appear in, he is usually aiding Skurvy in one of his many schemes to steal the Crystal Coconut. He sometimes questions the purpose of pirate rules and doesn't see the point in burying the stolen treasure if they're only gonna dig it back up again. He hasn't studied the Pirate Handbook as well as Kutlass has, which makes him out to be a walnut-brained bottom-feeder in comparison. Green Kroc is voiced by Len Carlson. Green Kroc is apparently of French descent as evidenced by his French accent. Green Kroc also has a (rare) habit of slipping back to his native tongue. This appears to be coincidental, as the Donkey Kong Country television series is of French origin. Occasionally, his voice gets switched with Kutlass' due to internal errors. This page was last edited on September 25, 2018, at 21:07.